We were let down with regards our Sunday lunch reservation (the place we wanted to originally go was closed due to technical issues), so on the off chance I gave Hixter a call – they had space! Hixter is the sister venue to Tramshed in Shoreditch, so I had some high expectations with regards decor. It didn’t disappoint – Hixter was smarter than Tramshed, with a few closed off rooms, a large restaurant and open kitchen. 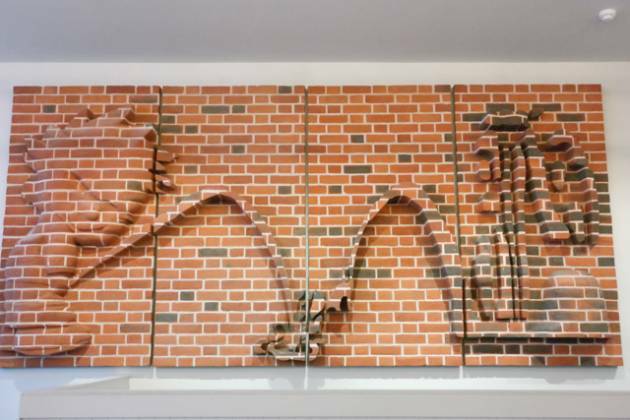 They had an interesting wall mural, I’ve included a photo below – can you guess what it is? Tables were laid out with linen napkins. In a similar manner to Tramshed, there was an interesting moving picture on the wall in the toilets, along with bizarre wall paper! I ordered a lager for me, Claire had a glass of processco. We had table water too, for a whole £1.00. 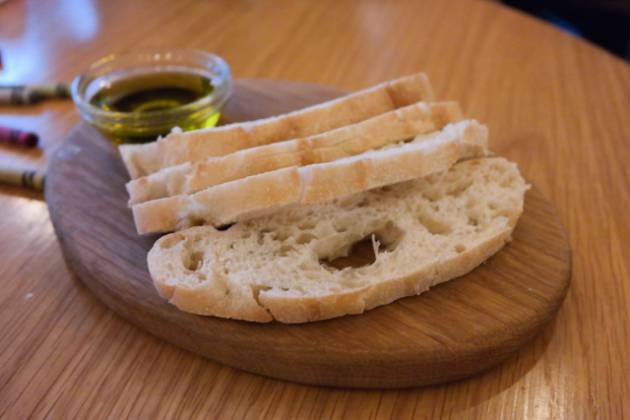 Due to the time (past 1pm), we decided to go straight to the main course – nice bread was served for us to nibble on while waiting for our meals. 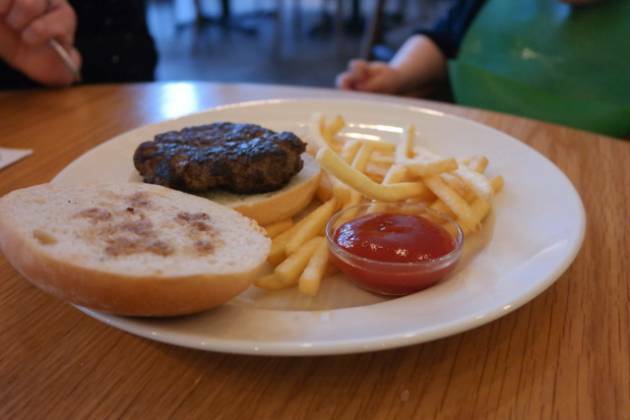 We ordered our toddler, JW, a burger – he could share some of our vegetables. Claire ordered roast chicken for herself, I asked for the sirloin. My dish came out – a huge slab of pink beef, along with 4 roast potatoes, broccoli, cauliflower cheese and a large Yorkshire pudding. We each had a small pot of gravy too. The beef was amazing (as good as The Laughing Gravy) – so tender and seared wonderfully. The potatoes were good, not crispy but did have a nicely cooked outside and were delicious inside. 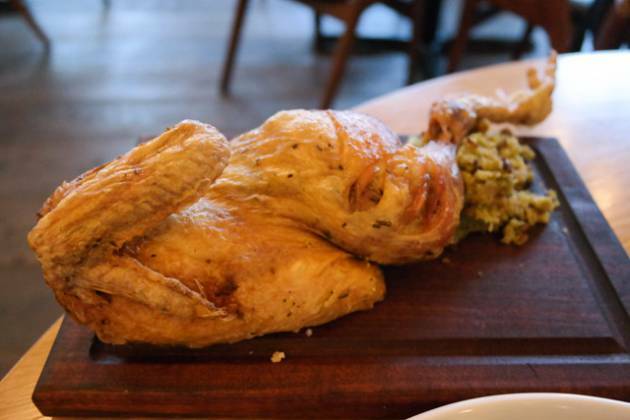 Claire’s roast chicken came out as a half (when we ate at Tramshed, it was served slightly differently ;-)) – still had a foot on it though! The chicken was excellent, a very large serving – so much so, we ended up with a doggy bag (which had a recipe for chicken broth)! 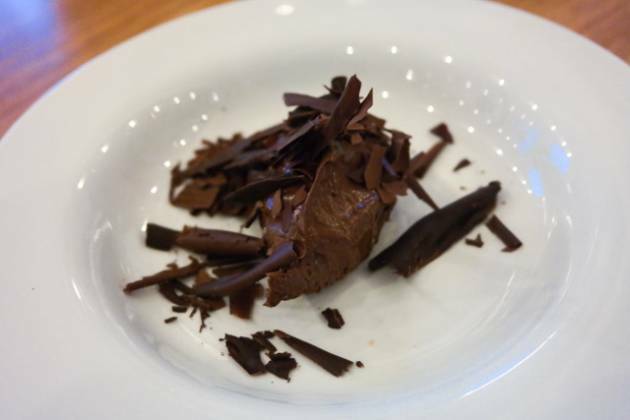 I just had to have a dessert after such a nice lunch – I ordered the “Peruvian Gold Chocolate Mousse” (at £6.95). It was beautiful, almost liquid chocolate. The waitress also brought JW a free mince pie, which was very kind indeed. The staff were very welcoming with JW, giving him the time of day as they walked past. When giving us menus, they also gave JW some crayons, so they do accommodate families. The changing area was downstairs in the (extremely clean) disabled toilet. 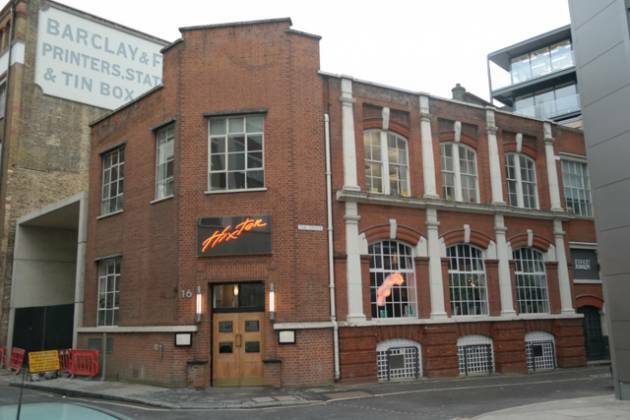 I actually preferred Hixter to The Tramshed – probably due to the fact it wasn’t in a warehouse. The staff were excellent, very friendly and good with JW. A smart venue that doesn’t take itself too seriously. The food was excellent, some of the best roast beef I have had since starting the reviews. 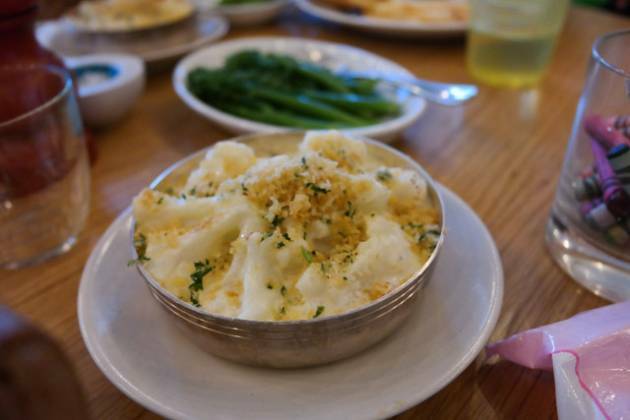 The rest of the food was also very good – anywhere with cauliflower cheese will score favourably :-). Oh, and JW’s meal was free on Sunday! 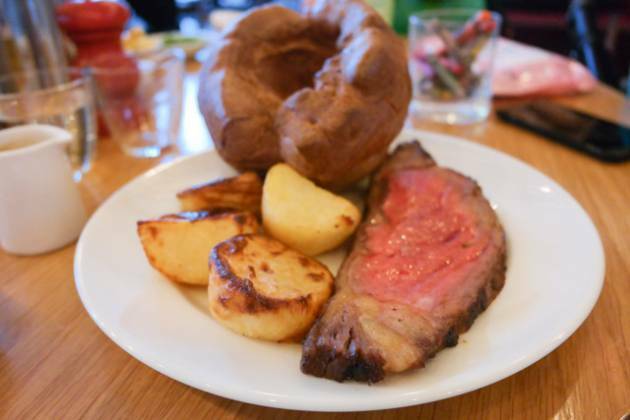 Overall then, an excellent Sunday lunch at Hixter, Bankside in London – one I can recommend for families and celebrations alike!